The Arrow Lock Cylinders are constructed of solid brass with 6 tumble chambers that are pinned 5 for Grade 2 Locksets and pinned 6 for Grade 1 locksets and all hotel locksets. Standard Arrow "A" keyway is the default however additional Arrow keywys are available as well as competitive keyways. Standard finishes are US4 and US26D. 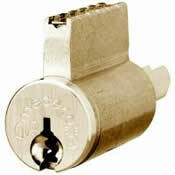 Deadlock cylinders are available. “A” keyway standard. Arrow sectional keyways available. Competitive keyways available. All locks are not created equal. 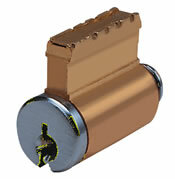 Medeco® Lock Cylinders provide a high degree of security by incorporating special design features inside each cylinder. Medeco cylinders offer superior pick resistance, are virtually bump proof, offer excellent resistance against drilling and other forced attacks, large number of combinations and a utility patent to protect against unauthorized key duplication. Pick and bump attack resistance is accomplished through the use of specially designed pins that must be elevated and rotated to an exact position in order for the lock to operate. False slots on the sides of the pins, along with mushroom shaped top pins, and with the incorporation of the reciprocal slider mechanism, further enhance the cylinder's pick resistance. To resist drilling, hardened steel inserts are used to protect critical areas of the plug face, shell and sidebar. Additional drill resistance is provided by hardened steel rods inside the bottom pins and selective use of hardened steel top pins. Protection against the unauthorized duplication of keys is accomplished through the use of strong utility patents and strict factory key control policies. Additional restriction on key cutting occurs due to fact that a special key cutting must be used to accurately reproduce the critical angled cuts on a Medeco key. 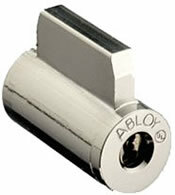 The Abloy Protec is a unique patented series of locks that have rotating discs instead of pins that make the cylinder virtually pick-proof. Keys and discs uses a new principle where cuts are made on two different radii. In addition, the return bars block the disc at 90 degrees if the key and cylinder combinations are not identical. This provides extra protection against bumping and lock picking There are 1.97 billion different combinations per keyway, which makes it possible to create extensive master-key systems to handle all possible situations. 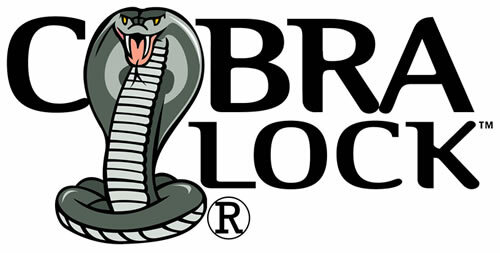 Protec comes in a full range of high security cylinders, deadbolts, padlocks, furniture and cam locks. The Protec cylinders will retrofit into most door knob sets and deadbolts.